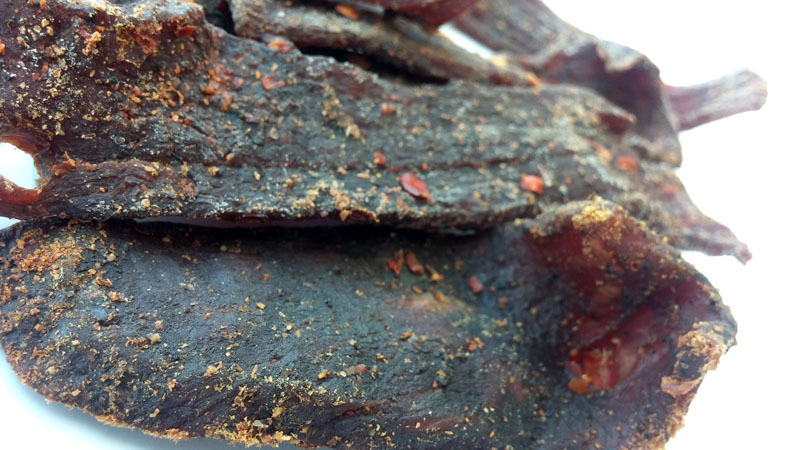 Jerky Dynasty is a brand started by Chris Miller. 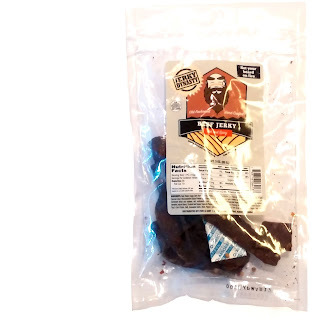 It actually started a few years ago as an online retailer of jerky, offering brands like Lawless Jerky, Jeff's Famous Jerky, and others. Recently, the company launched its own line of jerky aptly named, "Jerky Dynasty". According to Chris, Jerky Dynasty is "old fashioned", clarifying that it's hand cut, hung in a smoke house, with no liquid smoke. This Hot and Spicy variety is described by the company simply as, "sure to set your taste buds ablaze". Beef, water, sugar, salt, hydrolyzed soy protein, worcestershire sauce powder, crushed red pepper, cayenne pepper, garlic powder, onion powder, flavoring, hydrolyzed vegetable protein, granulated garlic, black pepper, cure salt, corn syrup solids, cayenne pepper, red pepper. The first flavors that come to me are a light salt and light smoke. A bit of garlic comes in later, along with a light spiciness. The chewing brings on a little more smokiness, along with a bit more garlic and onion. The heat builds up some more. For being advertised as, "hot and spicy", and "sure to set your taste buds ablaze", it holds up somewhat. There's definitely a spiciness to this, but not necessarily "hot" and certainly doesn't set my taste buds ablaze. I'm certain, however, if you have a low tolerance to hot spices, this would be hot. But then again, if you're a spicy food lover, you might see this as light or moderately spicy. I'd rate this on my heat scale as, "medium" (level 3 out of 5). Otherwise, the primary taste profile is that of a light wood smoke, with a salty, garlic and onion flavor. 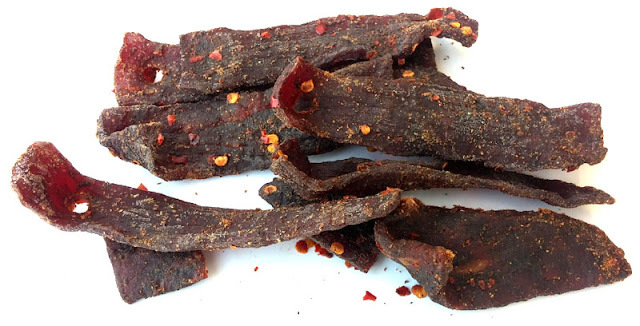 There are touches of cayenne and chile pepper flavors to back that up. The meat consistency looks excellent. Practically all meat, mostly tender, soft, yet retaining some chewiness. It's very meaty, practically a steak-like chewing texture. 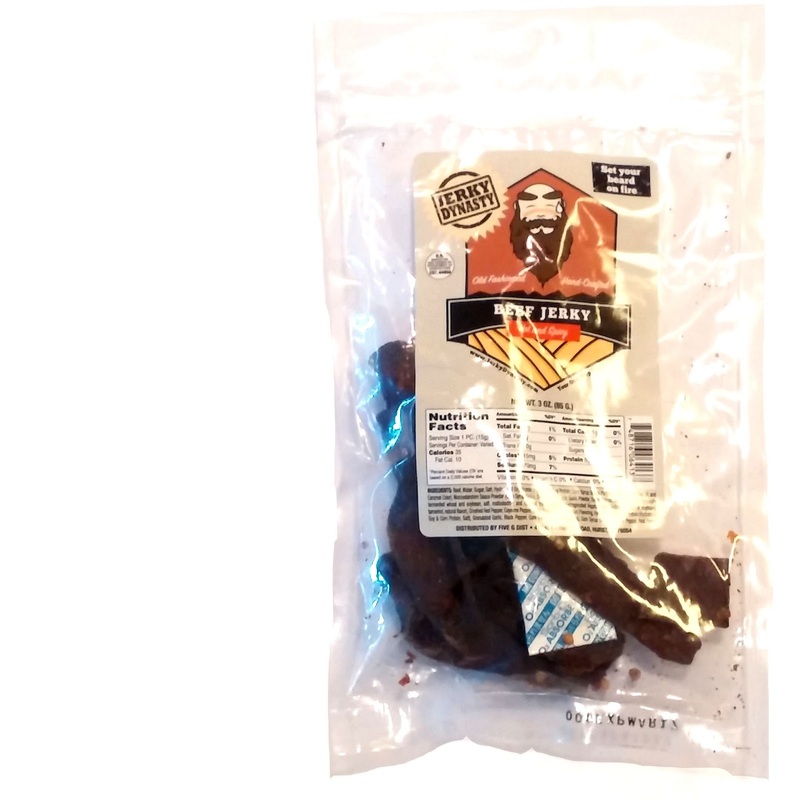 This Hot and Spicy beef jerky from Jerky Dynasty delivers a noticeable spiciness, though not hot enough to set my taste buds ablaze. If you don't tolerate spiciness, you'd never buy this. On the other hand, if you love spicy snacks, you might find this not hot enough. To add to that, I don't taste much of the cayenne or red chile pepper flavors. Otherwise, it's very much comparable to the company's Original variety, just with a moderate level of heat thrown in.